Factory calibration can also be carried out at your premises on request. For this ROTRONIC uses its specially developed HG2-S humidity and temperature generator. It offers such perfect convenience that it serves as basic hardware both at customers sites and worldwide at providers of calibration services. 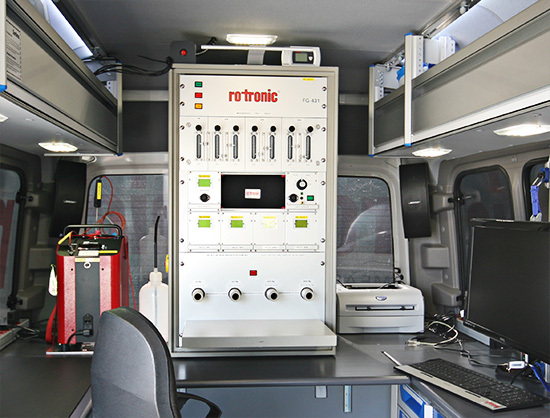 ROTRONIC offers its customers a unique calibration service – we come to you with our mobile calibration laboratory and calibrate your ROTRONIC or third-party climate probes in the shortest of times! Using our dynamic FG-431 humidity generator or the portable HygroGen2, we can calibrate your humidity and temperature probes on site in typically 3...5 minutes per calibration. We will give you the calibration certificate as documentation immediately after the calibration. Our calibration range of 0.1…99 %RH is also unique. Why not challenge us with your specific calibration requirement? We can of course also carry out pure temperature calibrations on site in a range of -25…145°C !